When we say worldwide shipping, we mean worldwide shipping! When you place an order at PlayseatStore, you will have your product(s) at home within 48 hours, no matter where you live! That's because we always chose the quickest way of transport and work with international transport companies like FedEx, UPS, TNT, DHL and more, to assure a fast and secure delivery. As soon as you place an order we start processing it. Someone at the PlayseatStore office verifies your order and sends it to the depot. Here your products are packaged for safe transport and are sent on their way as soon as possible. 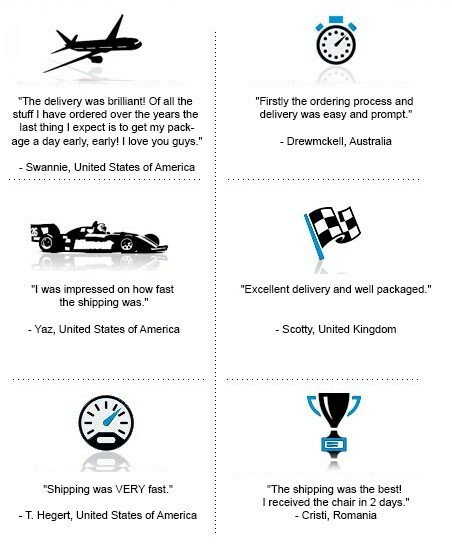 We really try to speed things up as much as we can and therefore you receive your order within 48 hours, anywhere in the world. Your products will be delivered in 24-48 hours after you placed your order. If you have any concerns, feel free to contact us! When you order is checked in, you receive a tracking code. This way you can follow the journey of your order and see when it’s scheduled for delivery. If you have any concerns, feel free to contact us! If you have any special whishes or needs regarding the delivery of your order, feel free to contact us at Contact@PlayseatStore.com.